This guy knows his stuff, he has been designing and building Wind Turbines the last 40 years. He does several size's and length of blades. He even shows you how to carve blades to the ideal shape and form. My humble understanding is that fewer blades offer superior efficiency of some type. I'm sure that subject gets complicated of course. 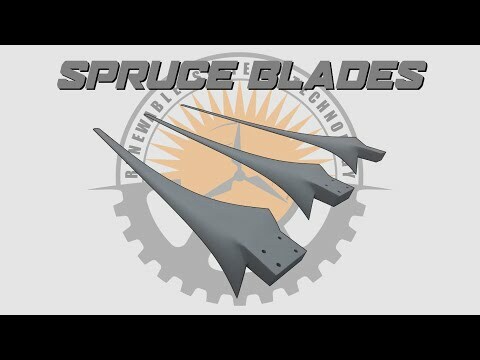 Fewer blades get "clean" air for each blade. Not much information to make any suggestions. Specific generator, RPM, windspeed range, power output? There are a bunch of links if you search 'custom wind generator blades'. You might also get some ideas from the blade calculator at https://www.warlock.com.au/mobile/tools/bladecalc.htm. Are you wanting to make your own? A die and a press could make good aluminum blades in 1/2 second. Of course home made is always more satisfying. Just go ahead and make yourself a set like these! !